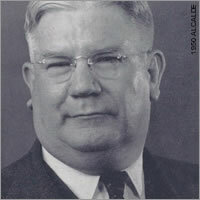 Harmon Luther Lowman was seventh president of SHSU, serving the second longest term, 22 years (1942-1964). He attended Washington and Lee University in Virginia and later enlisted in the army during WWI. Afterwards he taught and finished his education with a bachelor's degree at Southwest Texas State Teachers College, and a master's degree from the University of Texas. He continued on with his education receiving a Ph.D. from the University of Chicago. Dr. Lowman was the first president to have an earned doctorate. The campus grew dramatically during his tenure, especially in areas of residence halls and instructional facilities, and SHSU earned the claim as the first completely air-conditioned campus in the world. He secured Country Campus, which had been a World War II POW Camp, for only one dollar from the federal government. Enrollment exceeded 5,000 during the 1963-64 academic year. He was honored as a Distinguished Alumnus in 1984. The student center, started and almost completed during his tenure, was named in his honor.